Benign prostatic hypertrophy (BPH) is a common problem for men as they age. What treatments are available and how do they compare to the newer alternative to surgery or medications known as the Rezūm System? About half of men older than age 75 get out of bed several times a night to urinate (nocturia.) For many, the issue is an enlarged prostate gland. Although an enlarged prostate gland can be caused by prostate cancer, often it’s the result of a noncancerous condition called benign prostatic hypertrophy (BPH). Urine flow can be improved by surgically removing the prostate. But this method is not entirely risk-free. Some degree of incontinence or impotence is normal. Other treatments (discussed below) include medications as well as minimally invasive surgical procedures. Since BPH is not a dangerous condition, many men choose instead to simply suffer in silence. Last year, the Food and Drug Administration (FDA) approved the Rezūm System, which takes an entirely new, safer approach to treating BPH. The simple, five-minute office procedure restores proper urine flow with a low risk of side effects. By doing so, this procedure has the potential to improve the quality of life for millions of men. 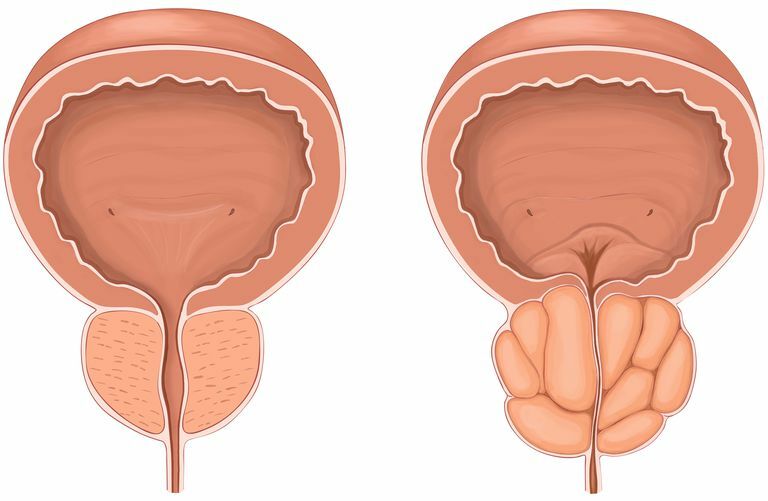 The urethra—the tube that empties the bladder—passes directly through the walnut-sized prostate gland. Prostate tissues grow as men age, which enlarges the gland and squeezes the urethra like a belt being gradually tightened around the waist. This makes it increasingly hard to empty the bladder completely at one time. Despite the urge to urinate, a trickle at a time becomes the norm. While the symptoms are usually fairly classic, your doctor will recommend tests to diagnose BPH before any treatment is undertaken. Surgery - Surgery to remove the prostate gland, called a transurethral resection of the prostate or TURP, is done under general anesthesia. An instrument is inserted into the urethra and the portion of the prostate surrounding the urethra is removed. Side effects include those related to anesthesia, as well as impotence and incontinence. Proscar (finasteride) and Avodart (dutasteride) work by blocking a hormone which causes the prostate gland to grow. The Rezūm System is also considered a minimally invasive procedure. Alternative medicine options - At the current time, there is no good evidence that herbal treatments for BPH, such as saw palmetto, are effective. Lidocaine is injected to numb the nerves leading to the prostate. The urologist selects four to 10 zones on the prostate and injects a tiny amount of steam into each. The steam kills the tissue, which the body simply reabsorbs. Each injection takes nine seconds and the procedure is over in less than five minutes. Men leave the office with a urinary catheter which is left in place for three days to compensate for swelling. Afterward, it is normal to experience a sense of urgency and frequency of urination for a period of time. Improvement is not immediate. However, some improvement in urine flow is usually seen in about three weeks. Dramatic improvement takes three months. What's Known About Results of the Rezum System for BPH? Because the Rezūm System is rather new, physicians have limited experience with it. In clinical trials, the procedure was used in men with prostates of a certain size. How well the technique works in larger prostates is now being tested. No major medical complications from the procedure have been reported. Because the steam heat stays in the prostate, the ability to ejaculate or have an erection is unaffected. And because the treatment does not damage the urinary sphincter, the risk of incontinence is very low. Long-term results of the Rezūm System are not yet available. Whether a second treatment will be needed in the future and, if so, how far into the future is still unknown. Evaluating the post-clinical trial results is currently underway with the hopes of answering some of these questions soon. After the FDA approved the Rezūm System, the company that developed the procedure allowed some medical centers involved in the clinical trials, including Cleveland Clinic, to offer it to patients. Cleveland Clinic began using the treatment in February 2016 and has been quite satisfied with the results, even teaching colleagues nationwide how to perform the procedure. The Rezūm System has ushered in an era of more patient-friendly treatments for a common problem. Fortunately, it’s just the beginning. We are now enrolling patients in clinical trials of three different systems for treating BPH, all with the potential for fewer side effects. BPH is a significant problem affecting 50 percent of men over 75 and almost 90 percent of those over 85. In addition to discomfort and a negative impact on your lifestyle, BPH can lead to other complications. In the past, an invasive surgical procedure (TURP) was the only treatment available, leaving many men to opt for suffering in silence. The Rezūm System adds a new and safe alternative to the procedures and medications currently available. Dr. Ulchaker is a urologist specializing in BPH at the Prostate Center at Cleveland Clinic’s Glickman Urological and Kidney Institute, the nation’s No. 2 urology program as ranked by U.S. News & World Report. Dixon, C., Cedano, E., Pacik, D. et al. Efficacy and Safety of Rezum System Water Vapor Treatment for Lower Urinary Tract Symptoms Secondary to Benign Prostatic Hyperplasia. Urology. 2015. 86(5):1042-7. Roehrbom, C., Gange, S., Gittelman, M. et al. Convective Thermal Therapy: Durable 2-Year Results of Randomized Controlled and Prospective Crossover Studies for Treatment of Lower Urinary Symptoms Due to Benign Prostatic Hyperplasia. Journal of Urology. 2017. 197(6):1507-1516. Woo H., and R. Gonzalez. Perspective on the Rezum System: A Minimally Invasive Treatment Strategy for Benign Prostatic Hyperplasia Using Convective Radiofrequency Water Vapor Thermal Therapy. Medical Devices (Auckland). 2017. 10:71-80. Is Avodart & Proscar Safe to Use for Men With Prostate Cancer?